Hiya Lovelies! Art here, chiming in to update you on the latest Apo board meeting news. 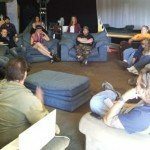 Cozied up in a circle of couches at the Fusion Factory a few days before Thanksgiving, 7 board members including 3 officers, 2 regional reps and a mix of 21 ignition and community members convened for November’s board meeting. It warms me thinking about how many ignition members, incumbent and new, are already ratified and it’s only November. Given the growth of our organization, besides all the other to-do’s, the board will be busy working on reevaluating, defining and classifying all the ignition roles. Caroline Kert gave an update on the Ignition wiki project. For those who are wondering, wiki’s are community developed sites that allow all the users to edit or add content. Apogaea has the foundations of one built. 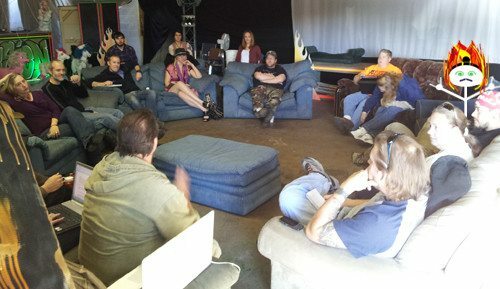 Caroline, Grandpa and Secretary, Duney Dan are starting this time intensive project to gather and load into the wiki: important Apogaea documents; history of decisions made and art grants funded; important financials and organizational reports. It will consolidate information and create consistency for ease of reference and future use. Vice President: April “Glitterati” has been focusing energy into art and art projects for Apo. She has recently spoken with Dave X from Burning Man about nailing down a date for a flame effects workshop. One of the other ideas she is supporting is to develop a “cross-pollination” of our Apo art projects. We would send a select one or few to other regionals, and in return have their artists provide an awesome experience at Apo. April is also working on setting up better processes for Apo volunteers at the event such as tracking who shows up and who misses shifts, getting the schedules out to volunteers in advance and increased communication in general. Secretary Duney Dan is juggling various projects including compiling the contact list of new ignition members and updating the organizational chart. Plus, don’t forget the work with Caroline and James on the wiki to gather all organizational information/documents in one place. Discussion ensued about this position as it would be new. It would involve consent promotion, sexual boundaries. The board would like to create the position don’t have a name for it yet. It was suggested to maybe discuss the role with other regionals like Flipside. Koda suggested the name for this role should sound positive. Sa-weet! The board announced their Board Retreat will happen on December 1st. I’ll share more details on the outcome of the discussions at the retreat as soon as possible! If you recall from the August 2012 Board Meeting Summary, the first almost-daunting project of the new finance committee was to audit the books going back one year, and then decide if it were necessary to go back further. Thanks to the finance committee for all their hard work on the audit! James “Grandpa” Whiddon, Art Committee Lead, spoke to the board about the art grant timeline and information needed to get the art grant process rolling for 2013. He has worked on the proposal, researched the historical grant amounts and revised the timeline and accompanying web pages. James asked the board to give him a solid number for the grants to give applicants a feel for the total money pool from which grants will be drawn. After discussion regarding the scope of deciding the amount to be allocated to art grants in 2013, it was agreedthat the board would provide James a fixed amount by December 2nd. I’ll announce more about the grants on December 5th. *Transportation and storage for the effigy? Community members are encouraged to attend! And as usual, we will desperately attempt to post the agenda more than a few minutes in advance of the actual meeting. Wish us luck! Grant Cycle for 2013 is Open!